The Wembley Arena stop on Madonna's box-office busting Confessions tour will be released as part of a CD/DVD set Jan. 30 via Warner Bros. Portions of the DVD were originally broadcast during an NBC special over Thanksgiving. "The Confessions Tour" includes a 13-track CD as well as the complete London concert on the DVD disc, including four songs that didn't air on TV and an uncensored version of Live To Tell. The track list focuses largely on Madonna's 2005 album Confessions On A Dance Floor but also sports oldies such as Like A Virgin, Erotica, Lucky Star and La Isla Bonita. Meanwhile, Madonna is up for three Grammys at the Feb. 11 ceremony: Get Together for best dance recording, I'm Going To Tell You A Secret for best long form music video and Confessions on A Dance Floor for best electronic/dance album. Madonna covered a true classic within the opening number Future Lovers: Donna Summer's 'I Feel Love' which was released in 1977 on the trip-through-time concept album 'I Remember Yesterday' where it was the closing track, marking the "future". It's widely accepted that 'I Feel Love' is the first disco-style song recorded with an entirely synthesized backing track, becoming hugely influental in the development of electronic music. It was a #1 hit in the UK, a top 10 hit in the US and of course a Dance hit in the clubs (that legacy is obviously kept alive by Madonna's numerous Dance #1s). 'I Feel Love' saw a lot of cover versions, including by Kylie Minogue & Red Hot Chili Peppers. Madonna's Future Lovers is a tribute to it and on tour she put a new twist on both songs, with a bit of sexual innuendo in horseriding. Madonna's megahit Music from 2000 saw a new re-invention, with mixing The Trammps' 'Disco Inferno' with it, which was released in 1976, but got an immense popularity when it was included in the movie Saturday Night Fever (on its soundtrack too) in 1977. It became a 1970s and a rollerskating staple, that was shown on tour when Madonna came back to stage in a Travolta white suit, doing his moves while the dancers did a rollerskating choreography. The most famous homage of Madonna as of late is of course directed to Abba. She wore a striped unitard, inspired by what the Abba girls wore on their very last world tour in 1978/1979, during Erotica (which had a Studio 54 feel) & La Isla Bonita. For Lucky Star, she put on a cape that said 'Dancing Queen', referring to Abba's signature #1 hit. And of course, she closed the show with Hung Up that sampled the 1979 hit single 'Gimme Gimme Gimme (A Man After Midnight)'. It's a quiet month for news so now we're taking time to remind fans from The Netherlands, Belgium & Hungary about upcoming Confessions Tour broadcasts. Dutch fans can catch Madonna on VARA at 10 pm on December 30th. In Belgium, Flemish fans can confess on VijfTV at 10.30 pm while Walloons will see her at 9.05 pm on PlugTV on December 31st. 2007 will have a great start for Hungarian fans, RTL Klub will show the concert just a few minutes after midnight on New Year's Eve. Naturally, all of them will show the uncensored version, debuted on Channel4 UK last month. Madonna and Guy Ritchie are learning Chichewa - the native language of their adopted son from Malawi, according to a report. The couple are said to want to help David Banda, who they controversially fostered earlier this year, stay close to his culture. They are confident they will keep him despite legal challenges, but have said he will have the option of returning to Africa when he is older. "Madonna and Guy use the few words they've learned," a source told The Sun. "'Mummy', 'daddy', 'hello', 'my love' and some others, every day." Following yearly tradition, Belgian Radio Donna is broadcasting their all time top, this year the Top 2006, between Christmas and New Year. Madonna has no less than 28 entries in the list. Also in 2006, Like A Prayer is the highest entry, scoring into the top 100. You too can still help decide the exact position of this song by voting on the Donna website. This year's website is extremely well done: if you search on 'madonna', you can see all her entries, with their current position and the chart position history of the previous years. You can also add your own stories related to each of the songs. Wishing you all a safe and happy holiday season. May the New Year bring peace in your heart and all around the world. If you haven't already, check the Mad-Eyes intro for a nice Xmas surprise. Madonna has recently finished a new photoshoot and commercial to show off M by Madonna collection for H&M. M by Madonna was designed by Madonna and will be debuting in stores in March. Madonna & Steven Klein are frequent collaborators, whose photographs have been the cover of Madonna's latest multi platinum selling CD, Confessions on a Dance Floor, as well as two W Magazine spreads, and the subject of an exhibition in Tokyo and Moscow. We can't wait to see what they come up with next! Check back to Madonna.com for more updates. On a slow news week, let's look at the official Warner release sheet of Confessions Tour DVD (click to enlarge; thanx to Madonnalicious). Now it seems in North America the release will be CD+DVD [CX] only, in a regular CD-case, making the album to be eligible to chart on the Billboard 200. It is unknown if there will be a DVD-case version internationally. The tracklist matches the already confirmed one. The DVD includes all the performed songs, including the 4 numbers that were cut in the broadcast (Sorry (Remix) [Don't Talk Don't Speak], Drowned World/Substitute For Love, Paradise (Not For Me), Lucky Star). The CD tracklist misses out several key tracks, it focuses on Confessions On A Dance Floor. The DVD tracklist names 'Confessions' & Live To Tell as separate tracks, while the CD tracklist says 'Confessions' only. We still hope that Live To Tell (which Madonna called her own confession) is on the CD too, it would be a wasted release if the dancers' confessions flows into the uneventful Isaac, omitting two key songs. 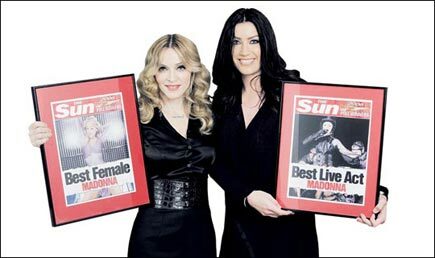 The sheet says Madonna has sold more than 200 million albums worldwide and that I'm Going To Tell You A Secret went top 40 (it sold 70,000 copies in the USA, by the way). The sheet also confirms the bonus behind-the-scenes footage and the photo gallery for the DVD. The release will have a Parental Advisory sticker. Forget the battle for the Brits - the only awards celebs care about winning are the Bizarre Readers poll gongs. The biggest names in rock, pop, and comedy queued up to get their hands on my prestigious awards. Madonna was delighted to be the big winner with Best Female and Best Live Act for her breathtaking Confessions world tour. 21 December - Madonna's movie directing debut? Madonna will make her movie directing debut in 2007, according to reports. The pop superstar is understood to be getting behind the camera for a movie entitled Blade To The Heat. Madonna's own company, Maverick Entertainment, are listed as the producers of the film in an entry at hollywood.com. Apparently the movie is a "boxing story loosely based on the 1959 bout between Emile Griffith and Benny 'Kid' Paret." UPDATE: Fansite DrownedMadonna says Madonna is not directing the movie and she's not part of Maverick Films or anything Maverick.